We still have quite a few bits from the butchers we visited last week so tonight some massive steak burgers came out of the freezer and into our tums! I griddled the burgers for a few minutes and then finished them off in the oven to make sure they were cooked all of the way through. I served them on half a ciabatta roll, topped with some sauteed red onions. 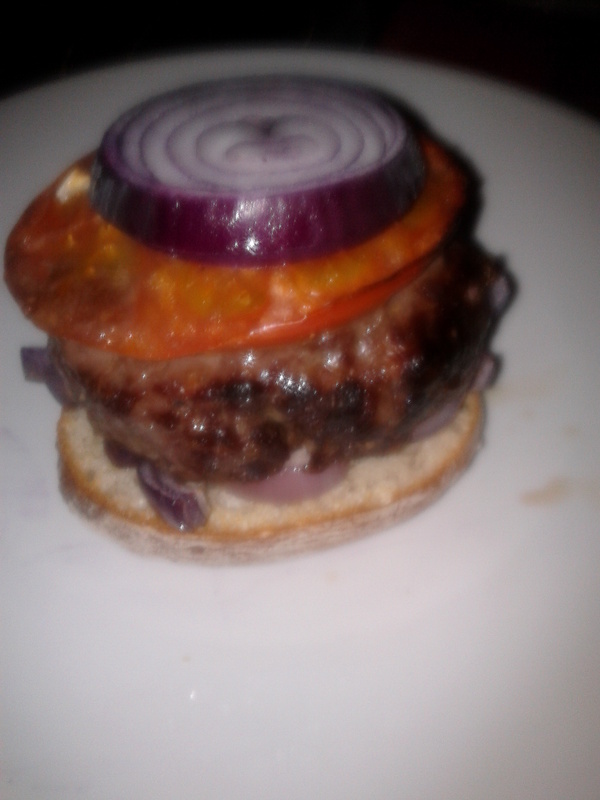 I topped the burger with a slice of tomato and red onion for a contrast of texture. On the side we had some jalapenos, salad, cheddar and Stilton and a tomato and radish salad- a bit of a pick and mix. The burger was nice but could have done with a bit more seasoning if I’m honest- it’s always better to make your own in the end as you can get them seasoned and flavoured to exactly the way you want.